Team USA plays its final WJC preliminary round game against Canada on Tuesday at 11:30 a.m. U.S. is in first place in its Division at 3-0, while Canada is 2-1. The game airs lives on NHL Network and is being streamed live on nhl.com. The U.S. has already earned a spot in the medal round. A win or tie against Canada would clinch first place in Group A and one of the two top seeds in the medal round, which begins on January 2. Danny O'Regan, who sat out the 8-0 shut out of Germany as a precaution after an injury, is expected to return as center of Team USA's top line. 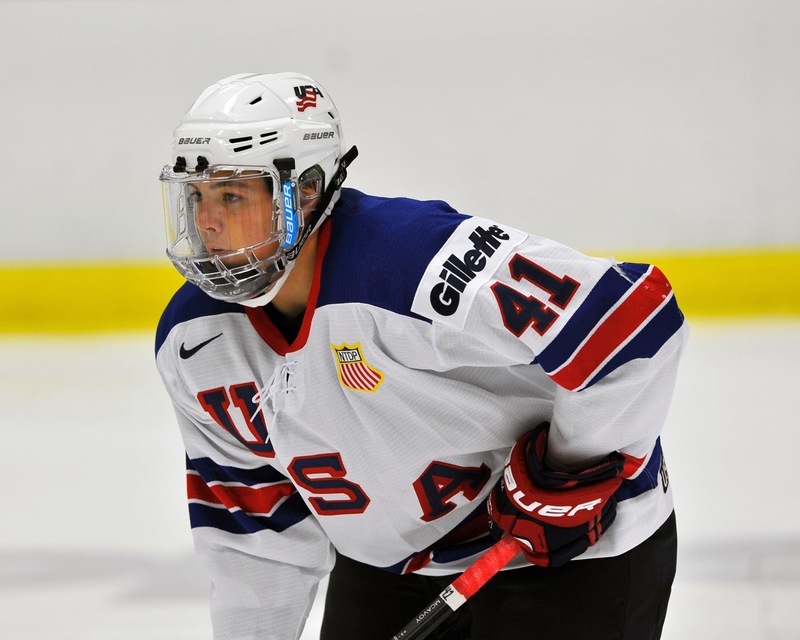 2015 recruit Jordan Greenway scored a hat trick while fellow 2015 recruit Charles McAvoy (photo) scored a goal and two assists in the NTDP U17s’ 14-1 blowout of Germany in the World U17 Challenge in Nova Scotia. Next up for Team USA is Canada Atlantic on Tuesday. Game time is 6 p.m. ET and the contest will be lived streamed for free by FastHockey. ►Episode 11 of Inside BU Hockey features Bernie Corbett's interviews with Head Coach David Quinn, senior forward Jake Moscatel and former Terrier defenseman David Warsofsky. Last week, Warsofsky made his NHL debut and scored first NHL goal. Check back later today for a link to this week's program. Former Terrier and 2009 Hobey Baker finalist Colin Wilson scored twice, including the game-winner, and added an assist in Nashville's 6-4 win against Detroit. A first team All-American at BU, Wilson earned first-star honors for his three-point effort. Olympic gold medal goalie Jim Craig is "still making saves" according to the Sioux City Journal, following the former BU All-American's presentation to physicians about screening for abdominal aortic aneurysms, which took the life of his father, Donald. USA Today's Kevin Allen reports his picks for the U.S. Olympic team, which includes former BU captain and All-American Kevin Shattenkirk. Team USA earned its third win of the World Junior Championships in Malmo, Sweden, cruising past Germany, 8-0. Assistant captain Matt Grzelcyk scored his second goal of the tournament and added a pair of assists and 2014 recruit Jack Eichel assisted on the U.S.’s third goal. Grzelcyk leads Team USA in scoring with a 2-4-6 line. Matt Grzelcyk — How fun has this kid been to watch in this tournament? After being the last cut last year, Grzelcyk has taken on a big leadership role this year. He’s leading as a captain, but also in his performance. Consistently Team USA’s most noticeable defenseman game in and game out, Grzelcyk’s three-point performance was well earned. He is a weapon on the back end and has been solid when needed defensively. Grzelcyk is even outperforming lofty expectations coming into the tournament. He leads Team USA with six points (2-4) through three games. 2014 recruit J.J. Piccinich and 2015 recruit Maxim Letunov each scored a goal and an assists for Youngstown, but the Phantoms dropped a 5-3 road decision to Muskegon. Piccinich’s league-leading tenth power play goals was his 17th score of the season and his seventh tally in the last seven games. Letunov’s goal was his 13th and fourth in the last four games. OverTheBoards.com tweeted that Piccinich will suit up for the USNTDP U18s for their New Year’s Eve matchup with Miami U. Former BU captain Kevin Shattenkirk followed up his shootout-clinching goal Saturday night with a game-winning slap shot with 11 seconds left in overtime last night, as St. Louis edged Dallas, 3-2. Now tied for fourth in scoring among NHL defensemen, Shattenkirk is a strong candidate to make the U.S. Olympic roster. Matt Nieto, who began the season with San Jose and then had a few brief trips to the minors, was moved up to the Sharks’ second line tonight, seeing his ice time nearly double, as San Jose defeated Anaheim, 3-1, ending the Ducks’ 10-game winning streak. A New York Times hockey blog article on player development in the Penguins organization looks at the critical role played by Wilkes Barre/Scranton Penguins head coach John Hynes, a member of BU’s 1995 National Championship team. Team USA shoots for a third preliminary round win this morning vs. Germany in a 9 a.m. ET start, airing on NHL Network and streamed on NHL.com. 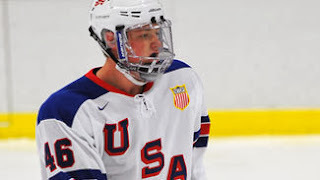 ● Team USA stats: Matt Grzelyk and Jack Eichel (photo) are tied with Michigan’s Andrew Copp for team lead with 3 points. 2014 recruit J.J. Piccinich scored a power play goal and 2015 recruit Maxim Letunov scored twice, including an extra-attacker goal, but Youngstown’s comeback fell a goal short, as Indiana edged the Phantoms, 5-4. Piccinich has a team-leading 16 goals and is tied for the USHL lead in power play goals with nine. Letunov’s pair give him a 12-13-25 scoring line. Youngstown mounted a strong comeback effort in the third period, beginning with Maxim Letunov’s whirling goal in front of Pawloski, spinning from right-to-left in front of the cage to go to his forehand and score. The NTDP U17s begin the World U17 Challenge today with an opening round match-up against Russia. Gametime is 1 p.m. ET with free live streaming from Fast Hockey. BU 2015 recruits Jordan Greenway and Charles McAvoy have 19 and six points respectively for the U17s this season. Boston University continued their run on recruiting in picking up another Select 70 ranked prospect, committing very highly-regarded forward prospect Jordan Greenway. The 6’4 forward has been a mainstay on our Select 70 rankings, in the top three since the first ranking in May and after surveying much of the country, it’s hard to find many with more upside or ability. He has a feel for the puck typically not seen in a player his size, especially at a relatively young age, and is able to make clever puck distributions on the transition. Whether cutting to the net, bearing down on the wing or using his speed and frame as a weapon up the neutral zone, Greenway is tough to miss. At the U16 level (for SSM last season), Greenway could be seen skating somewhat uninspired at times, only to take a bump the wrong way and follow it up with two or three consecutive dominant shifts, weaving the puck up ice through an entire team and getting off two or three shots in a single shift. Greenway’s athleticism is elite, hockey sense is there, and even better for college hockey (potentially BU as well), younger brother James has arguably even more upside. James, a 1998 defenseman at Shattuck isn’t at the same stage in his development that Jordan was at this time last season, but he’s similarly huge and has the upside to take over games from the back-end as he continues to add faculties to his skillset. Former Terrier defenseman David Warsofsky scored his first NHL goal, pulling the Bruins even with Ottawa in the third period after Boston had trailed by a pair, but Bobby Ryan’s late goal gave the Senators a 4-3 win. Former BU captain and All-American Kevin Shattenkirk assisted on the game-tying goal late in the third period and then provided the shootout game winner for the Blues in their 6-5 comeback win over Chicago. The win gave St. Louis a perfect 3-0 record this season against the defending champion Blackhawks. Marie-Philip Poulin’s goal midway through the third period brought Canada even with the U.S. at 2-2, but Team USA prevailed in the shootout, winning 3-2, in a pre-Olympic matchup.